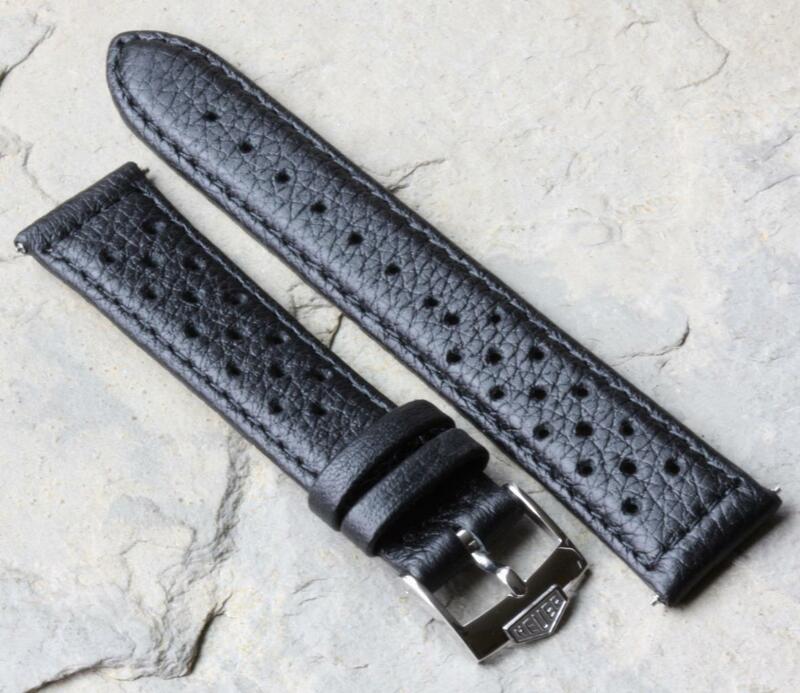 These are a great economical and very comfortable everyday wear option for a band on your vintage or newer Heuer Carrera, Autavia, Camaro, Monza, Monaco, Montreal or Pasadena. 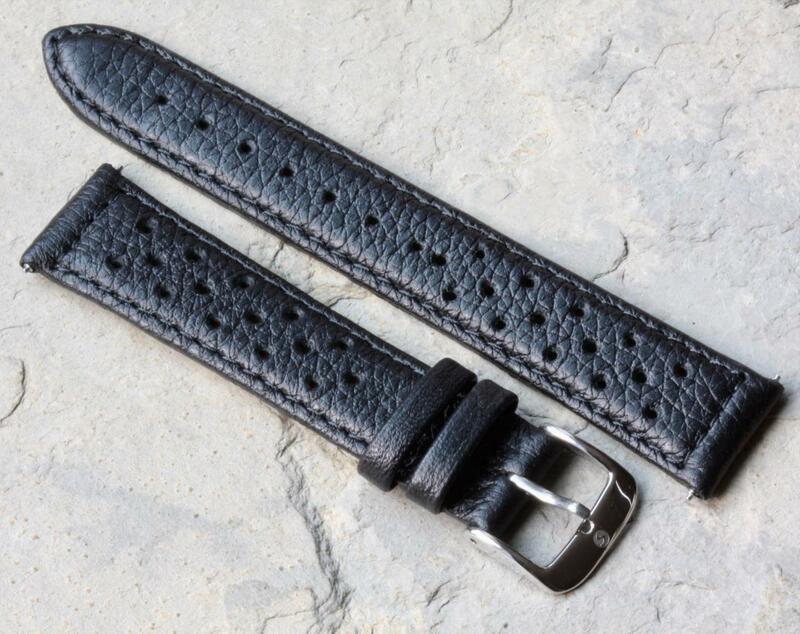 Newly made Genuine Leather racing straps that can come fit with a Heuer reissue "B" buckle or with the other buckle style shown. Perfect combination for the early vintage Heuer Carrera 18mm lugs models or any 20mm lugs Heuer chronograph. At a great combination price for a band with a Heuer buckle or available without a Heuer buckle so you can install your own. 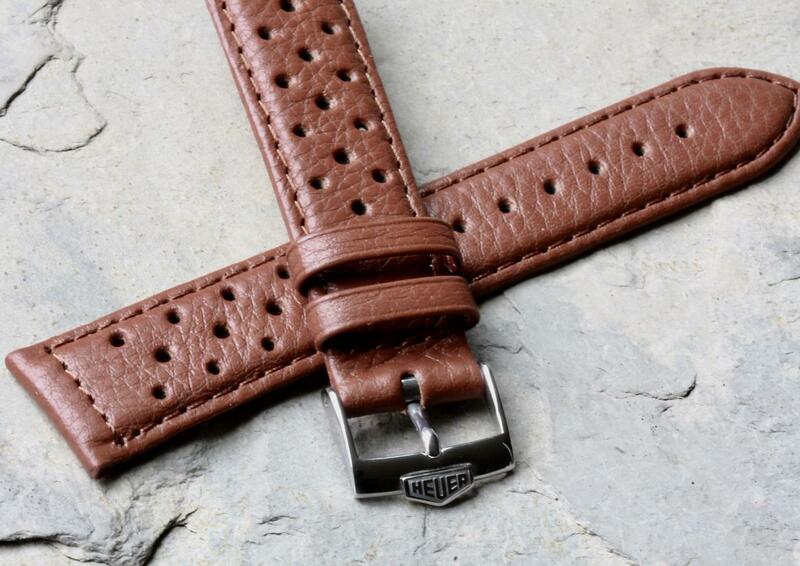 Highly textured calfskin looks like the original Heuer Corfam bands. 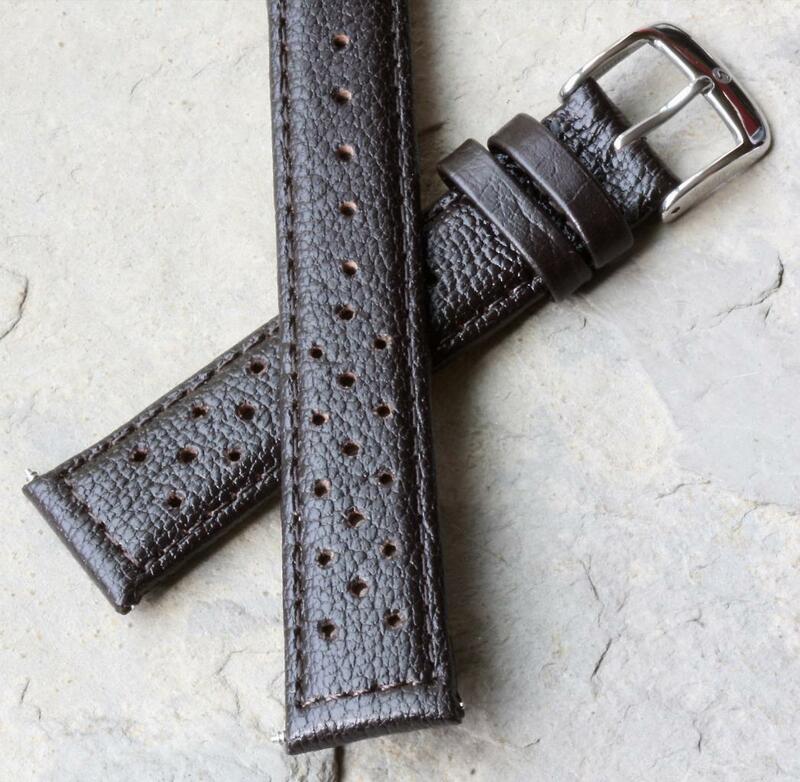 Fully stitched for durability. 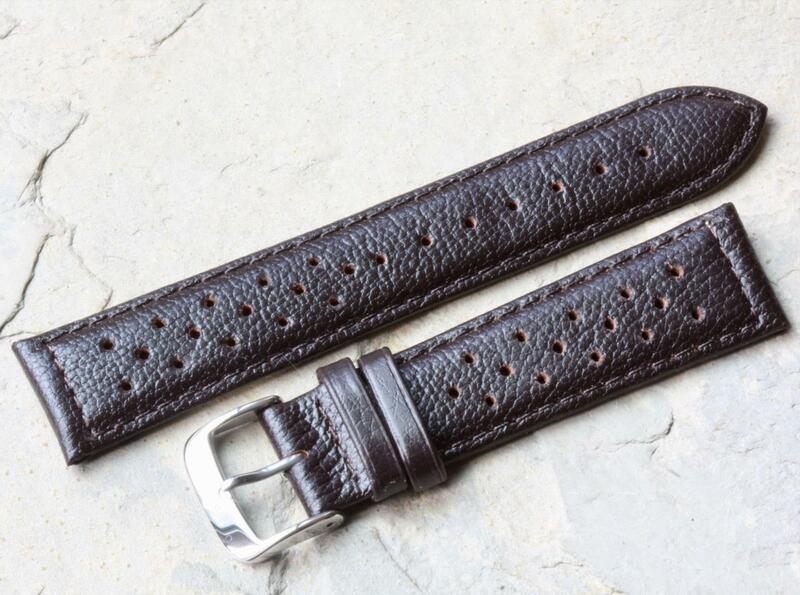 Lined with soft calfskin. Very comfortable fit. 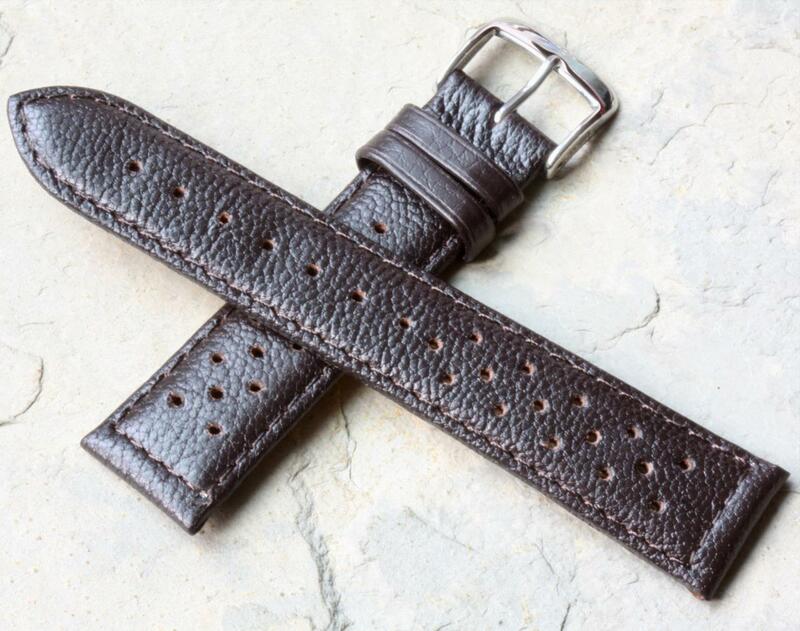 Available in three colors: black, honey tan or dark brown. 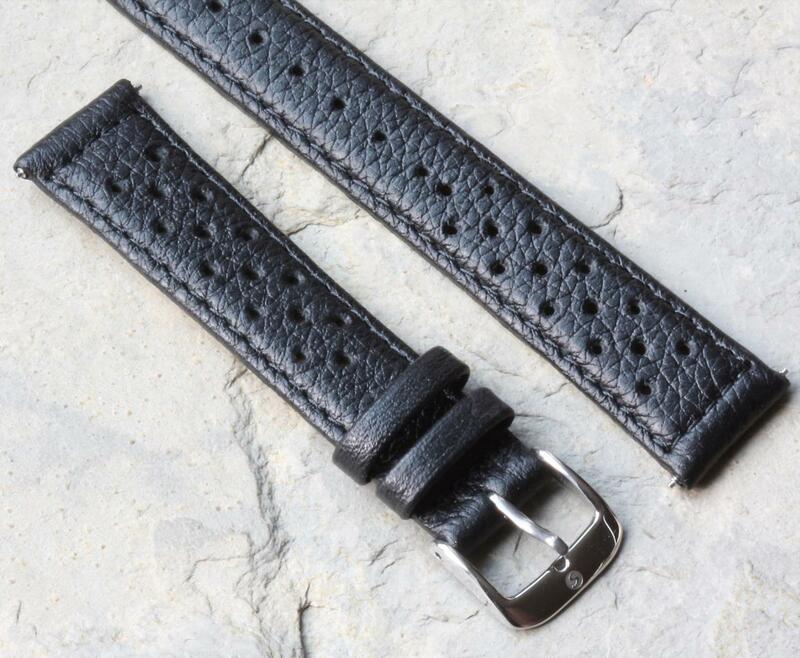 Standard length strap measures 7 3/8 inches (18.5cm) placed end to end, not counting the buckle. Metric measurement of the two pieces is 113/72mm. 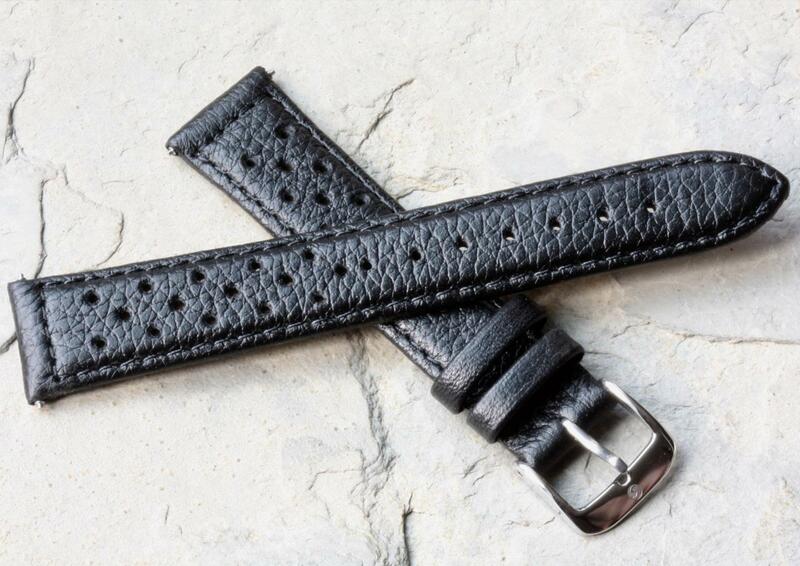 Fully perforated black leather band that is lightly padded. 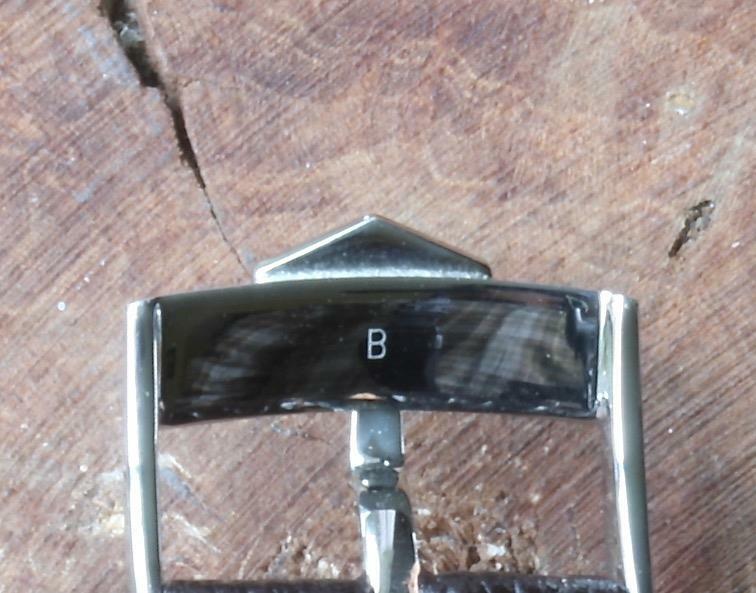 Thickness of the band ranges from 4mm where it meets the watch to 3.4mm at the tail end. 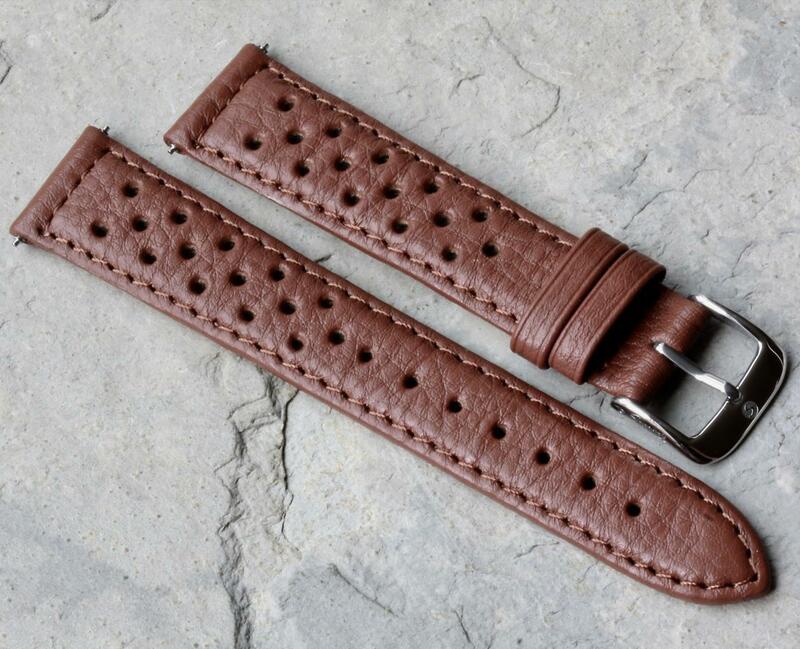 The strap micro-adjusts with center sizing holes all the way down the length of the strap for even the smallest wrists. 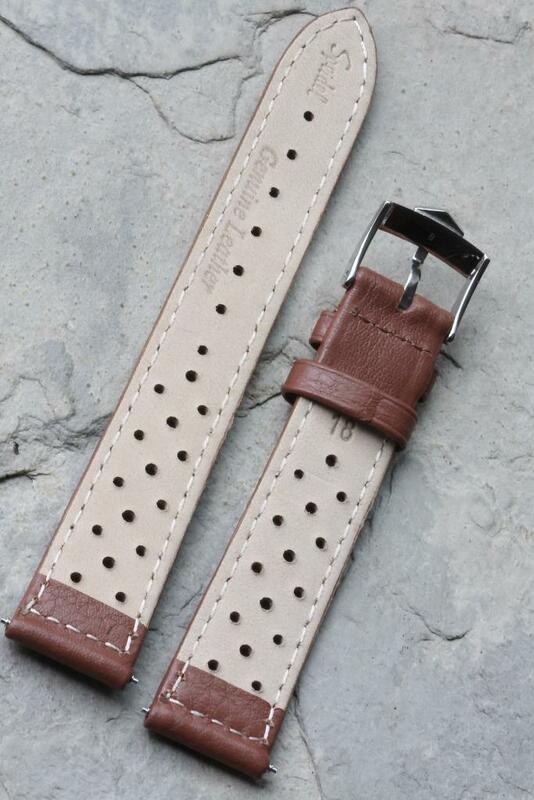 This strap also has double strap keepers; one slides and one is fixed. 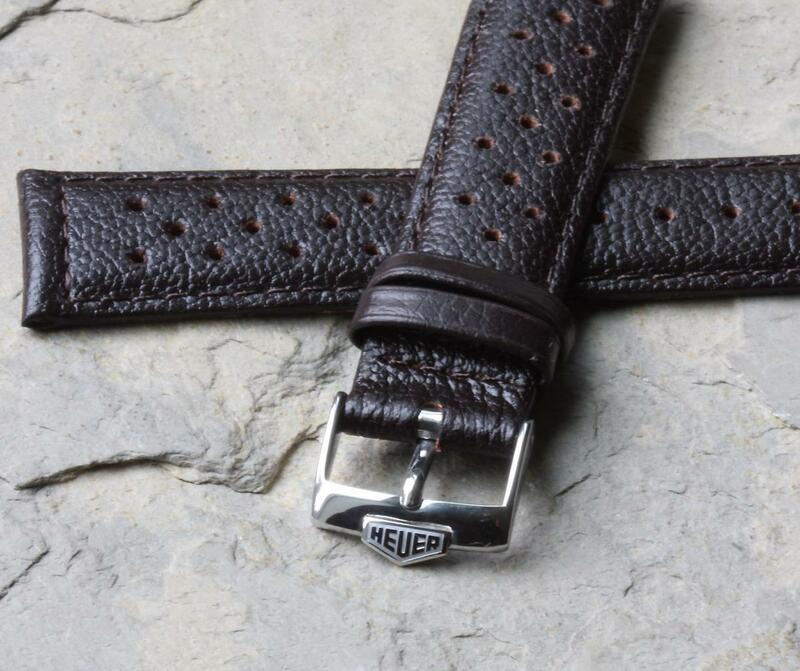 The 18mm and 19mm bands come with a 16mm opening Heuer buckle and the 20mm bands comes with an 18mm opening Heuer buckle. U.S. shipping is $7.99 for First Class or $13.99 for Priority that arrives in most places within 2-3 days. International buyers email for a shipping quote to your country.